In the 2019 Honda Pilot, you and your family can enjoy your travels to your various destinations thanks to all of the innovation, comforts and capabilities of this stylish SUV. Aspects like its 280-HP, 3.5L V6 Engine, roomy 8-passenger seating, Honda Sensing® safety technology and numerous other features are what make the Pilot an exceptional ride. Here at Honda Auto Center of Bellevue, we stock the new Pilot in numerous trims and colors to choose from and employ a friendly and knowledgeable team of sales associates who can help you explore each one if you’d like. Don’t hesitate to grab the family and make the short trip over from Seattle so that you can experience it for yourself in person! The new Honda Pilot can impress you with all of its innovation, power and amenities on-screen. In person, though, the views and feelings you can take in from this exceptional SUV are incomparable. 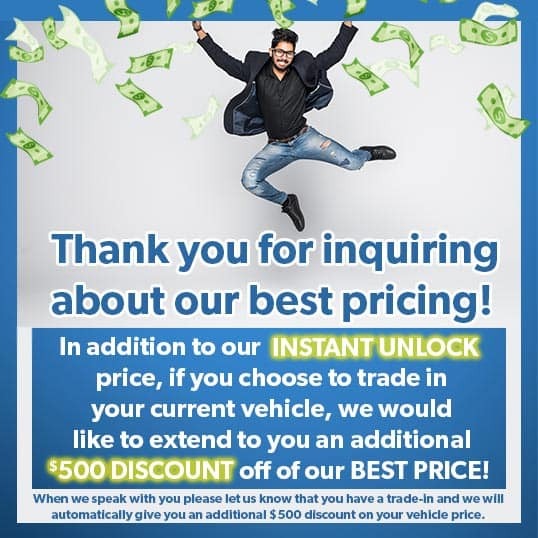 That’s why we invite you to take advantage of our convenient website where you can further explore our new cars for sale in case any others interest you and then schedule your test drive before heading over from Seattle. Our professional teams here at Honda Auto Center of Bellevue are ready to assist you with any automotive need you have! Interior Features: Air Conditioning with Air-Filtration System, Sunglasses Holder, Push Button Start, Power Windows with Auto-Up/Down Driver's and Front Passenger's Window, Power Door and Tailgate Locks, Cruise Control, One-Touch Turn Indicators, Tilt and Telescopic Steering Column, Multi-Functional Center Console Storage, Lockable Glove Compartment, Sliding Sunvisors, Remote Fuel Filler Door Release, Rear Window Defroster with Timer, Rear-Seat Heater Ducts, Cargo Area Light, Hidden Storage Well, Cargo Area Tie-Down Anchors (4 Total), Cargo Area Bag Hooks, Capless Fuel Filler, Beverage Holders (Front Row-5 / 2nd-Row-6 / 3rd-Row-4), Map Lights (All Rows), Garment Hooks (2nd row, 2 total), Front Passenger's Seatback Pockets, Illuminated Steering Wheel-Mounted Controls, Front and 2nd-Row Floor Mats. Exterior Features: LED Low-Beam Headlights with Auto-On/Off, Fin-Type Roof-Mounted Antenna, Rear Privacy Glass, LED Brake and Reverse Lights, Intermittent Rear Window Wiper/Washer, Security System, Variable Intermittent Windshield Wipers, Remote Entry, Black Body-Colored Power Side Mirrors, Black Door Handles, Black Roofline Spoiler with Integrated Brake Light. Interior Features: Push Button Start, Power Windows with Auto-Up/Down Driver's and Front Passenger's Window, Power Door and Tailgate Locks, Cruise Control, One-Touch Turn Indicators, Tilt and Telescopic Steering Column, Multi-Functional Center Console Storage, Lockable Glove Compartment, Sliding Sunvisors, Remote Fuel Filler Door Release, Rear Window Defroster with Timer, Rear-Seat Heater Ducts, Cargo Area Light, Hidden Storage Well, Cargo Area Tie-Down Anchors (4 Total), Cargo Area Bag Hooks, Capless Fuel Filler, Beverage Holders (Front Row-5 / 2nd-Row-6 / 3rd-Row-4), Map Lights (All Rows), Garment Hooks (2nd row, 2 total), Driver's and Front Passenger's Seatback Pockets, Illuminated Steering Wheel-Mounted Controls, Front and 2nd-Row Floor Mats, Tri-Zone Automatic Climate Control System with Humidity Control and Air Filtration, Driver’s and Front Passenger’s Illuminated Vanity Mirrors, Conversation Mirror with Sunglasses Holder. Exterior Features: LED Low-Beam Headlights with Auto-On/Off, Fin-Type Roof-Mounted Antenna, Rear Privacy Glass, LED Brake and Reverse Lights, Intermittent Rear Window Wiper/Washer, Security System, Variable Intermittent Windshield Wipers, Programmable Remote Entry, Body-Colored Heated Power Side Mirrors with Integrated LED Turn Indicators, Body-Colored Door Handles, Body-Colored Roofline Spoiler with Integrated Brake Light, Smart Entry with Walk Away Auto Lock®, LED Fog Lights, Roof Rails, Parking Sensors (front/rear), LED Low-Beam Headlights with Auto-On/Off, Memory-Linked Side Mirrors with Reverse Gear Tilt-Down. Interior Features: Push Button Start, Power Windows with Auto-Up/Down Driver's and Front Passenger's Window, Power Door and Tailgate Locks, Cruise Control, One-Touch Turn Indicators, Tilt and Telescopic Steering Column, Multi-Functional Center Console Storage, Lockable Glove Compartment, Sliding Sunvisors, Remote Fuel Filler Door Release, Rear Window Defroster with Timer, Rear-Seat Heater Ducts, Cargo Area Light, Hidden Storage Well, Cargo Area Tie-Down Anchors (4 Total), Cargo Area Bag Hooks, Capless Fuel Filler, Beverage Holders (Front Row-5 / 2nd-Row-6 / 3rd-Row-4), Map Lights (All Rows), Garment Hooks (2nd row, 2 total), Driver's and Front Passenger's Seatback Pockets, Illuminated Steering Wheel-Mounted Controls, Front and 2nd-Row Floor Mats, Tri-Zone Automatic Climate Control System with Humidity Control and Air Filtration, Driver’s and Front Passenger’s Illuminated Vanity Mirrors, Conversation Mirror with Sunglasses Holder, HomeLink® Remote System, Integrated Sunshades (2nd-Row), Automatic-Dimming Rearview Mirror, Leather-Wrapped Steering Wheel, Leather-Wrapped Shift Knob. Exterior Features: LED Low-Beam Headlights with Auto-On/Off, Fin-Type Roof-Mounted Antenna, Rear Privacy Glass, LED Brake and Reverse Lights, Intermittent Rear Window Wiper/Washer, Security System, Variable Intermittent Windshield Wipers, Programmable Remote Entry, Body-Colored Heated Power Side Mirrors with Integrated LED Turn Indicators, Body-Colored Door Handles, Body-Colored Roofline Spoiler with Integrated Brake Light, Smart Entry with Walk Away Auto Lock®, LED Fog Lights, One-Touch Power Moonroof with Tilt Feature, Power Tailgate, Acoustic Glass Windshield, Roof Rails, Parking Sensors (front/rear), LED Low-Beam Headlights with Auto-On/Off, Memory-Linked Side Mirrors with Reverse Gear Tilt-Down. Interior Features: Push Button Start, Power Windows with Auto-Up/Down Driver's and Front Passenger's Window, Power Door and Tailgate Locks, Cruise Control, One-Touch Turn Indicators, Tilt and Telescopic Steering Column, Multi-Functional Center Console Storage, Lockable Glove Compartment, Sliding Sunvisors, Remote Fuel Filler Door Release, Rear Window Defroster with Timer, Rear-Seat Heater Ducts, Cargo Area Light, Hidden Storage Well, Cargo Area Tie-Down Anchors (4 Total), Cargo Area Bag Hooks, Capless Fuel Filler, Beverage Holders (Front Row-5 / 2nd-Row-6 / 3rd-Row-4), Map Lights (All Rows), Garment Hooks (2nd row, 2 total), Driver's and Front Passenger's Seatback Pockets, Illuminated Steering Wheel-Mounted Controls, Floor Mats, Tri-Zone Automatic Climate Control System with Humidity Control and Air Filtration, Driver’s and Front Passenger’s Illuminated Vanity Mirrors, Conversation Mirror with Sunglasses Holder, HomeLink® Remote System, Integrated Sunshades (2nd-Row), Automatic-Dimming Rearview Mirror, Leather-Wrapped Steering Wheel, Courtesy Door Lights (Front Row), Blue Ambient LED Lighting, Illuminated Beverage Holders. Exterior Features: Fin-Type Roof-Mounted Antenna, Rear Privacy Glass, LED Brake and Reverse Lights, Intermittent Rear Window Wiper/Washer, Security System, Variable Intermittent Windshield Wipers, Programmable Remote Entry, Body-Colored Heated Power Side Mirrors with Integrated LED Turn Indicators, Chrome Door Handles, Body-Colored Roofline Spoiler with Integrated Brake Light, Smart Entry with Walk Away Auto Lock®, LED Fog Lights, One-Touch Power Moonroof with Tilt Feature, Power Tailgate with Hands-Free Access, Acoustic Glass Windshield and Front Doors, Roof Rails, Parking Sensors (front/rear), LED Low-Beam Headlights with Auto-On/Off, Memory-Linked Side Mirrors with Reverse Gear Tilt-Down. Interior Features: Push Button Start, Power Windows with Auto-Up/Down Driver's and Front Passenger's Window, Power Door and Tailgate Locks, Cruise Control, One-Touch Turn Indicators, Tilt and Telescopic Steering Column, Multi-Functional Center Console Storage, Lockable Glove Compartment, Sliding Sunvisors, Remote Fuel Filler Door Release, Rear Window Defroster with Timer, Rear-Seat Heater Ducts, Cargo Area Light, Hidden Storage Well, Cargo Area Tie-Down Anchors (4 Total), Cargo Area Bag Hooks, Capless Fuel Filler, Beverage Holders (Front Row-5 / 2nd-Row-6 / 3rd-Row-4), LED (Front Row) Map Lights, Garment Hooks (2nd row, 2 total), Driver's and Front Passenger's Seatback Pockets, Illuminated Steering Wheel-Mounted Controls, Floor Mats (All Rows), Tri-Zone Automatic Climate Control System with Humidity Control and Air Filtration, Driver’s and Front Passenger’s Illuminated Vanity Mirrors, Conversation Mirror with Sunglasses Holder, HomeLink® Remote System, Integrated Sunshades (2nd-Row), Automatic-Dimming Rearview Mirror, Heated Leather-Wrapped Steering Wheel, Courtesy Door Lights (Front Row), Blue Ambient LED Lighting, Illuminated Beverage Holders. Exterior Features: Fin-Type Roof-Mounted Antenna, Rear Privacy Glass, LED Brake and Reverse Lights, Intermittent Rear Window Wiper/Washer, Security System, Variable Intermittent Rain-Sensing Windshield Wipers, Programmable Remote Entry, Body-Colored Heated Auto-Dimming and Power Folding Power Side Mirrors with Integrated LED Turn Indicators, Chrome Door Handles, Body-Colored Roofline Spoiler with Integrated Brake Light, Smart Entry with Walk Away Auto Lock®, LED Fog Lights, One-Touch Power Moonroof with Tilt Feature, Power Tailgate with Hands-Free Access, Acoustic Glass Windshield and Front Doors, Roof Rails, Parking Sensors (front/rear), LED Low-Beam Headlights with Auto-On/Off, Memory-Linked Side Mirrors with Reverse Gear Tilt-Down, Panoramic Roof.